When you have a toddler, meal time can be a bit tricky. Sometimes my daughter has a big appetite, other times she will only take a few bites. I have been pretty lucky with my little girl. She is a good eater and isn’t too picky. She tries whatever I give her but sometimes I don’t think she eats enough at meal time. That is why when she does eat, I want it to be healthy and nutritious so she gets the vitamins and minerals she needs to grow healthy and strong. 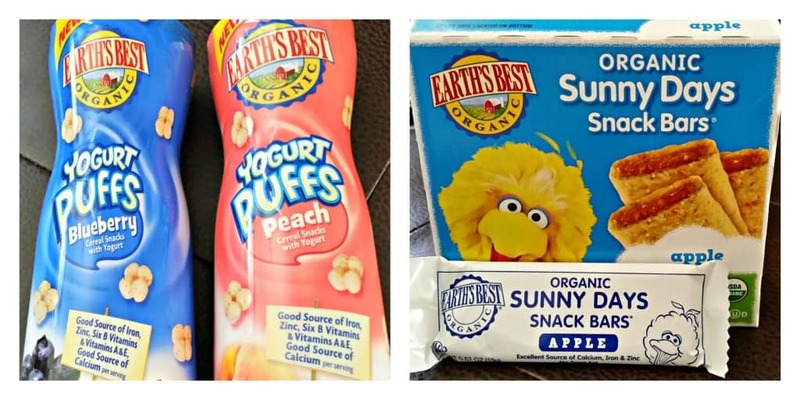 Earth’s Best sent me some of their new products to try that are made for toddlers. I thought they only made baby products, but I was wrong. They have a lot of options for parents of toddlers who still want to feed their little ones the best. I was sent several products for my daughter to try out. The thing that was by far the favorite was the Earth’s Best Organic Sunny Day Snack Bars in Apple. My daughter loved them! They smelled so good that I even tried a bite and they were delicious. They smelled like cinnamon and tasted like apple pie. She loved the taste but they did leave A LOT of crumbs so there was a bit of a clean up afterwards. I just had to make sure to keep the wrapper on the next time. And they have Big Bird on the box, who doesn’t love that? We were also sent 2 containers of Earth’s Best Organic Yogurt Puffs in Peach and Blueberry. I knew that she would love these because she loves the cereal puffs she already has. The Yogurt Puffs were very easy for her to pick up and feed herself, she even tried to give a couple to the dogs. I tried one and they were pretty good, just a hint of peach and blueberry flavors. They are also a good source of Calcium and vitamins. These are a great snack for her. The next thing we tried were the new Earth’s Best Organic KIDZ Fruit & Sunflower Wave and KIDZ Fruit & Veggie Wave. The flavors are: Apple Sauce & Sunflower Seed Butter, Banana & Sunflower Seed Butter, Apple Strawberry Beet, and Pear Carrot Mango. She loved all of the flavors. 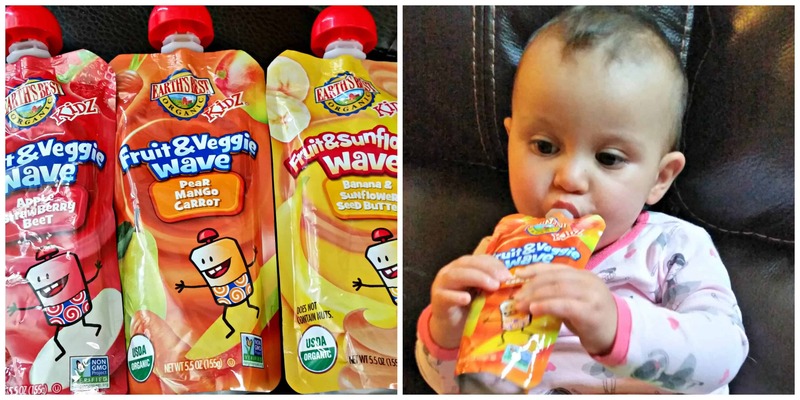 I like that these pouches are a lot bigger then the toddler pouches of other brands. She gets a lot more and it can even replace a lunch if you don’t have time to fix something yourself. She was full after one of these so I didn’t have to give her anything else. 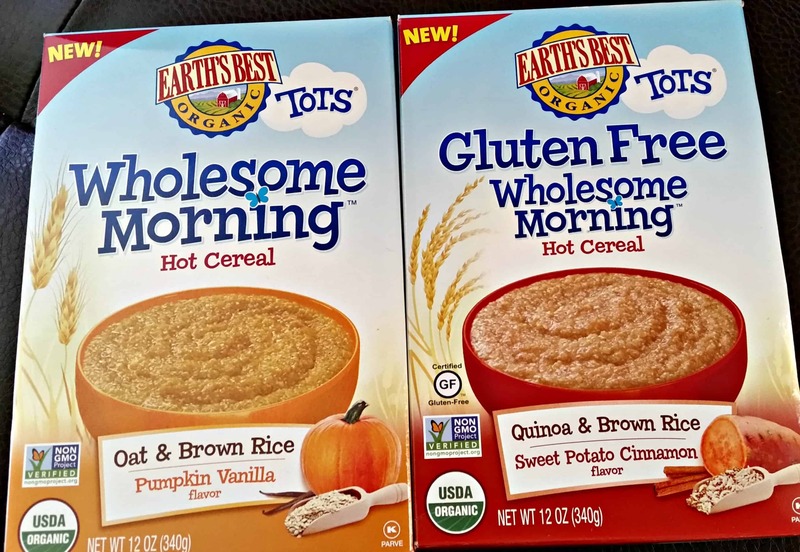 The last thing she tried was the Earth’s Best Organic Wholesome Morning Hot Cereal in Pumpkin Vanilla and the Gluten Free in Sweet Potato Cinnamon flavor. I have never given my daughter hot cereal before, she normally just eats oatmeal so I figured this would be similar. We tried the Sweet Potato Cinnamon and it had a similar consistency with oatmeal but it was a bit grainier which I don’t think she liked. She didn’t want to eat it, so I tried some and it didn’t taste bad, just like cinnamon. I added some applesauce to it and she ate it then. I do like that this cereal has whole grains and seemed to keep her full longer. It was very easy to make, just add water and microwave for 90 seconds. Maybe she will like the Pumpkin Vanilla flavor better. I was very impressed that all of Earth’s Best products are organic and non-GMO. I try to give my daughter healthy and nutritious food and the Earth’s Best products make it so easy and convenient to do that. Plus, she actually eats them! You can find Earth’s Best products at various retail stores like Target, Babies R Us, and Diapers.com. Earth’s Best is being kind enough to offer one of my readers the chance to win an Earth’s Best Prize Pack. This will include some of the items I got to review but it can be customized to your child’s age. This is open to US residents only. Just fill out the Rafflecopter form below.